Sound familiar? If so, you may need to take a hard look at your release management process. In the constantly moving, ever-evolving world of business IT, you can’t afford to push out half-baked releases. Yet, an overwhelming 75% of issues are a result of changes in software or its environment. To prevent costly delays and keep your organization’s operations running, you need to invest in a robust release management process. If your company has ever had to make a significant software change, chances are that you already appreciate the need for a reliable release management process. 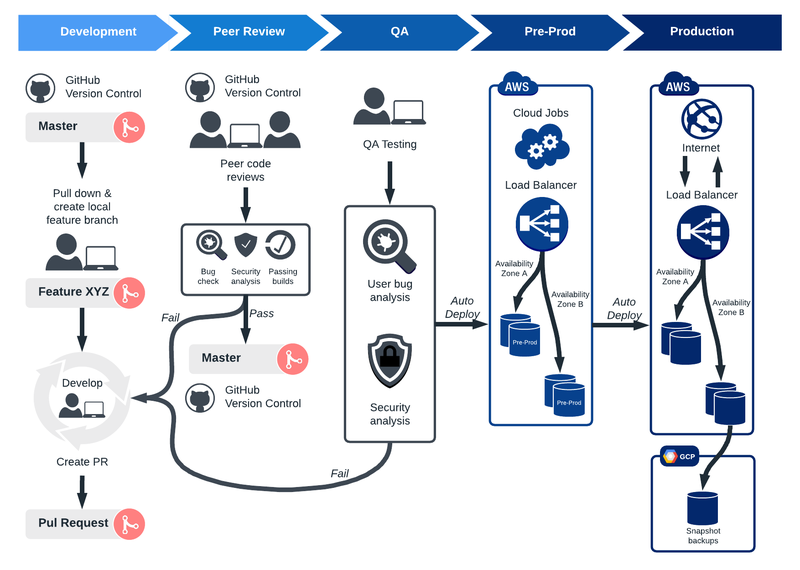 Release management oversees all the stages involved in a software release from development and testing to deployment. Release management is required anytime a new product or even changes to an existing product are requested. While release management processes may vary and should be customized for each organization, there are five primary steps to release management. The planning stage may be the most time intensive as this is where your entire release is structured from start to finish. A robust release plan will help your team stay on track and ensure standards and requirements are properly met. There are several ways to approach a release plan. 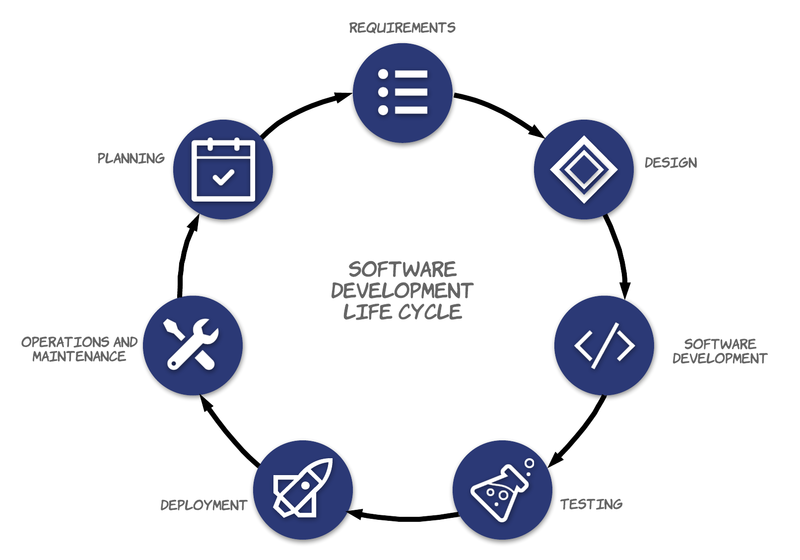 One of the most popular release management methods is the systems development life cycle (SDLC). The SDLC helps software developers plan, develop, maintain, and replace software systems with a high degree of efficiency and quality. The SDLC can be used in conjunction or in place of other project management processes. During this stage, create a workflow that both your team and key stakeholders can refer to throughout a release. There are multiple ways to map out your plan and clarify the process. One option is a release management checklist. The checklist should outline the process functions and responsibilities in roughly chronological order. When your team looks at the checklist, they should be able to quickly establish what step they are on and what their role or responsibility is. Another option is to create a release workflow. Lucidchart is a visual productivity platform that helps developers map their processes clearly. Create an intuitive flowchart of your release process using color coding, shapes, and swimlanes to designate timelines, roles, and tasks. Lucidchart operates on the cloud so you and your team can access the release plan or checklist anytime, anywhere with real-time updates. Once your plan is sketched out, present it to all relevant stakeholders (your team, product manager, and high-level leaders) for review. Get their feedback on any gaps or problems they see in the requirements or scope. Once the plan is approved and finalized, you can put it into action. With the release plan finalized, you can start designing and building the product for release. This is the actual “development” of the product based on the requirements outlined in the release plan. Once all the issues that may have come up are addressed, it’s time to subject the build to real-world scenario testing. This could take several iterations. As the team builds out the product, it is sent (usually automatically) to a testing environment for user acceptance. This allows the team to identify any bugs or issues that may arise in a real-world environment. As issues are identified, the build is sent back for development at stage two. In other words, within the iterative release management process, the work may flow from stage two to stage three and back again until the release is approved. User acceptance testing, also known as UAT, is when the end users the product was built for get to actually use it and give feedback. This is often done as a free beta trial online or shared with a larger group of employees within the company. User acceptance testing is the most crucial step to release management because of the amount of data collected and fixes required in order to get the build to where it needs to be for the official launch. As noted earlier, this is part of an iterative process. As bugs are identified, the team goes back to the drawing board to fix the issues and redesign the build for greater integrity. The build must pass the UAT stage to be considered for final implementation and release. This step is to put the finishing touches on the product, taking into account everything that was learned in UAT. Release preparation also includes a final quality review by the QA team. During the review, the QA team will conduct final checks to ensure the build meets the minimum acceptable standards and business requirements outlined in the release plan. Although UAT and quality assurance can’t always replicate every scenario that might occur once the product is launched, these steps hopefully fleshed out the most common bugs so that your team can better anticipate and prevent any problems at launch. Once the review is completed, the functional team will validate the findings and finalize the release for deployment. Before the build can deploy into a live environment, it must be approved by the product owner. The big day has finally arrived and here is where all your team’s hard work pays off. It’s time to release your product into the wilds of the live production environment. Besides simply sending the build out into production, the deployment stage also includes messaging and education on the product to both the end user and your company at large. For instance, users should be notified of changes with the release and how to operate within the new features. Depending on how significant the changes were, you may need to provide robust and ongoing training to get everyone up to speed. This is especially important for internal releases where employees using the software need to understand it to do their work efficiently and productively. Finally, during the deployment stage, the development team should meet to assess the release’s performance and discuss how the deployment went. If there are any lingering issues, those should be identified and documented for the team to address in the next iteration. Release management oversees a constantly changing process. Each release is an opportunity to refine everything from your workflow to your checklist as your team discovers what roadmap works best for what kind of launch—and what doesn’t. And with Lucidchart, even the most complex release management process can be designed to ensure a successful release your team can be proud of. The collaborative platform makes it easy for team members—from developers and product owners to executive stakeholders—to view the high-level plan and get at-a-glance insights into their progress so everyone is on the same page. Plus, Lucidchart integrates with popular management tools like Confluence, G Suite, and Slack, so you can import data and keep all your project details and outlines in one convenient place. Sign up for your free account and get started today.